Advantages: Directed towards the modeller, variety of subject matter, knowledgeable contributors, large format publication. There was once a time, when those of us with a passionate interest in the aircraft of World War I, had to fend for ourselves. The reference material needed to turn our Airfix “stringbags” into something resembling the aeroplanes of the past was scarce. There were periodicals that dealt with many aspects of the 1914-1918 period but none were aimed specifically at the modeller. In 1985 Ray Rimell came out with the first issue of a new quarterly publication that was to change all that. From the early “Xeroxed” copies of the times to the lavish issues produced today, “Windsock” has become a great source of knowledge for aircraft builders in all scales. Part of this pedigree is due to the contributors. Some of the best in their field have regularly submitted works, including Jack Bruce, Peter Grosz, Peter Gray, and Ian Stair to name just a few. Sadly some are now longer with us but a talented team from the next generation of enthusiasts is filling the void. With six issues per year now being the norm, the latest on the news stands is Vol.22, No.4. Its A4 format is logical since it allows the inclusion of plans in the two most popular modelling scales. Photographs can also be reproduced to their full potential and this is important regarding the period covered. 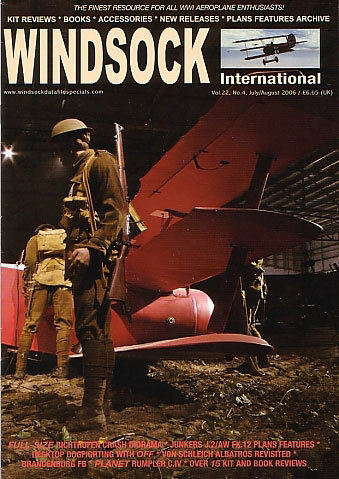 Gracing the cover is a photo from an ongoing project at the Omaka Aviation Heritage Centre in Blenheim NZ. This article describes the progress of a 1:1 scale diorama depicting the last moment of Manfred von Richthofen’s final flight. From the archives of Jack Bruce is a description of the bizarre Armstrong Whitworth three-seat triplane, complete with a set of three-view drawings from the late Ian Stair. Ian’s work also features along side a photographic exposé of the remarkable cantilever Junkers J.2 monoplane. George Haddow continues his series on Austro-Hungarian Naval aeroplanes and Ronny Bar takes a fresh look at the colour scheme of Eduard von Schleich’s famous Albatros D.V. He offers a convincing argument for the accompanied new artwork which is backed with appropriate period photos. Ray himself delves into the world of Flight-Sims with a “hands-on” review of “Over Flanders Fields”. Although computer games are not usually covered in this title, an exception is made here and comes with an impressive array of screen shots. Naturally there is the regular comprehensive round-up of kit, book and accessory reviews, as well as the latest news from the industry. Each issue of this 32 page publication carries a variety of subject matter. The editor goes to great lengths to cover a broad range of topics and the wealth of information is impressive. The wares from Albatros Productions have been a major factor in the resurgence of World War I aviation in the hobby industry. The enthusiastic and erudite contributors should leave the reader in no doubt as to the merits of this publication.